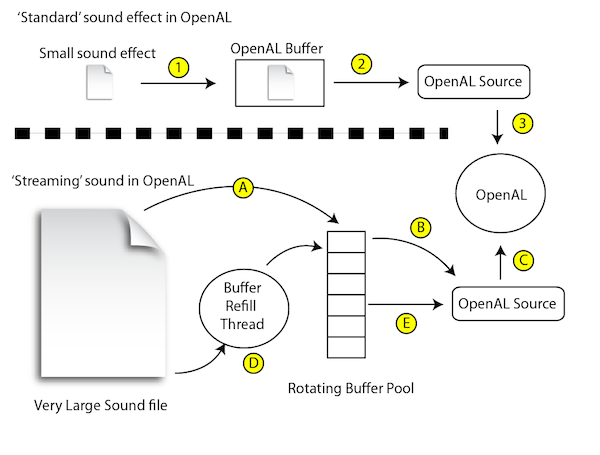 This article could be an interesting reference for people trying to understand how you can submit your own buffers to do streaming audio with OpenAL, but the actual tools I’m using (NVorbis, OpenTK) are outdated and I can’t recommend them anymore. If you’re looking for a modern C# way of doing the same thing, look at how the Song class is implemented with Ogg Vorbis support in Ethan Lee’s FNA library, using Xiph Vorbisfile and the DynamicSoundEffect API, especially if you’re trying to do this in a MonoGame- or XNA-like environment. It’s much faster, the codebase is cut by half, and much less threading pitfalls! Updated September 7th 2012 : New OggStream class with better support for concurrent stream playback. I was looking for a suitable replacement for the audio streaming and compression capabilities of XACT when porting an XNA project to MonoGame, and it doesn’t look like there’s a clear winner yet. MonoGame contributors suggested NAudio, but it looks like work needs to be done to make it portable, and the sample code is a mess. FMod EX or competing commercial solutions are an easy but costly choice. So I turned to OpenAL to see if it can be a free and usable solution for streaming compressed audio with some DSP capabilities. Out of the box, OpenAL doesn’t support being fed MP3 or OGG sources. There are extensions for those, but according to one implementation, they’re deprecated. So you need to handle decoding yourself and feed the PCM bitstream to OpenAL. It sure would be nice to have a purely managed implementation of libVorbis, but it doesn’t exist, so there’s a dozen homemade decoders floating around open source code hubs in various states of workability. I was pointed to NVorbis by TheGrandHero on the TIGSource forums, and I haven’t found a better alternative yet. 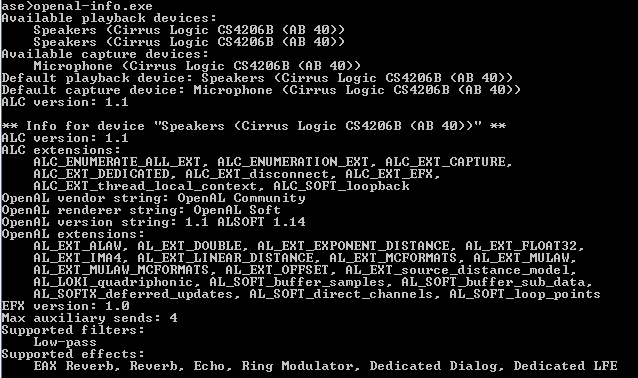 CsVorbis is another, but it doesn’t support streaming, all the decoding is done up-front, which defeats the purpose. OggSharp is just a fork of CsVorbis with XNA helpers, so nope. TheGrandHero also mentioned trying out DragonOgg but having problems with it. NVorbis worked like a charm for me, but it’s pretty early and doesn’t support some features like seeking around the stream, so looping or restarting playback requires creating a new whole new reader/decoder. I also took some time to optimize the memory usage in my fork of the project. 07/09/2012 Update : Andrew Ward, the author of NVorbis, resolved the memory allocation problems that the version I forked off had, so I pulled the new changes out instead. Once you have some decoded data, you have to make OpenAL stream it. This is sort of tricky but well–documented. In practice, since it involves threads, it’s a bit more obtuse than the pseudo-code, but OpenAL makes it relatively painless. The trick is to read enough data and often enough to avoid buffer underruns. Then, if you want to loop the sound, it’s not as easy as setting the source’s “Looping” parameter to true, because the buffers never contain the full sound file. Instead of no longer feeding the buffers when you hit the end of the Ogg stream, you just start back at the beginning and feed continuously, which has the nice side-effect of being 100% gapless. Finally, I wanted to have one fancy effect that XACT provided : low-pass filtering. This is used extensively in FEZ as a gameplay mechanic, so I could hardly live without it in MonoGame ports. Thankfully, OpenAL Effect Extensions (EFX) provide cross-platform effects including filters, at least in theory. In reality, this depends on whether the driver implementation supports them, and even the Creative reference Windows implementation doesn’t on my system. I was able to find a software implementation that does though, OpenAL Soft, and it’s cross-platform, so that bodes well. To override the installed implementation, just supply the software DLL in the application’s directory and voilà. Had no problems with it up to now, performance or otherwise. (* means synchronous buffering (Prepare()) has started, and ) means it ended. My code has only been tested on .NET on Windows, but I don’t see why it wouldn’t work in Mono either. Like all the unlicensed content on this blog, it’s public domain, but attribution is appreciated.